Spy Hunter is a free PC game and a remake of the original classic arcade game of the same name which was developed and published by Bally Midway in 1983. The Spy Hunter remake featured here does a good job of staying faithful to the many of the aspects that made the original so popular and fun to play. Driving the familiar white sports car, players will travel up the highway, racking up points, and battling those nasty blue enemy agent cars, motorcycles, and helicopters. Along the journey, you'll be able to quickly load up into the trusty weapon supply truck to get new weapons and gadgets for your fight against your menacing enemy vehicles. 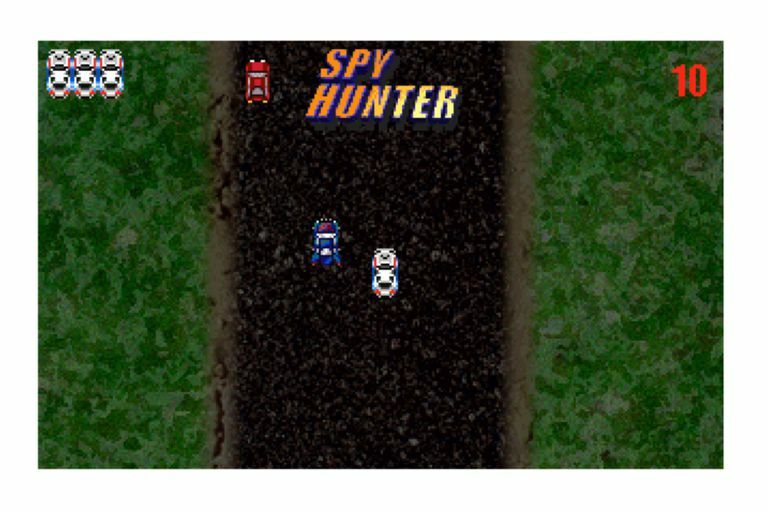 The gameplay in the Spy Hunter PC remake is quite similar to that of the arcade version, however, there are times when it seems as though the enemies and other cars on the road are much more difficult to defeat or drive around than the arcade version. Much like the original version, the game screen and car speed up the longer you drive up the road. It also features more daring enemy cars and more aggressive road hogs you'll need to avoid as well. The remake maintains the original pixel art from the arcade version. Overall, it is a worthy remake that can provide much enjoyment for fans of the original. The sites that provide a download for this free Spy Hunter remake for PC are fairly reliable. In addition to this remake, there are a number of other remakes inspired by the original arcade Spy Hunter game. One such game which is quite popular is Highway Pursuit which can be found with a simple search on Google. The remake of Spy Hunter game featured is free to play and download from Acid Play. The download has been tested and confirmed virus-free at time of writing, but it is always best to run your own virus scan and security check when downloading anything from the Internet. The original Spy Hunter game is a top-down vertical scrolling action/driving game that was released in 1983 by Bally Midway. Inspired by James Bond, the game was originally planned to have the James Bond name but proper licensing could not be acquired. In the game (much like in the remake), players control a white sports car as the screen scrolls vertically with players steering left or right to avoid other cars on the highway and enemy agents trying to defeat them. The arcade version featured a steering wheel control, a two-speed gear shift, and a foot pedal used to accelerate and keep the car moving forward. The object of the game was simple, points are earned for traveling up the highway, the farther you're able to drive, the more points earned. Points are also earned by defeating enemy cars and they are lost by accidentally forcing other "innocent" cars off the road. The roads and terrain change the longer you survive. At various times, you will have the ability to enter a supply truck that can equip you with additional weaponry and gadgets such as the ability to lay down an oil slick, smoke screen, or air missiles to defeat the helicopters that fly overhead. The game does not contain a true ending, that is, the road never ends and there is always the potential for someone to travel farther. Over the years there have been a number of ports and fan remakes, these include ports to DOS, Nintendo Entertainment System, Atari 2600, Commodore 64, ColecoVision, and many others. There have also been four remakes or re-imaging of the game such as the 2001 Spy Hunter release for the PC, PlayStation 2, Xbox and Gamecube systems, and 3 sequels with the latest being released in 2012. The original 1983 release of Spy Hunter arcade game also has a sequel of its own in Spy Hunter II which was released in 1987.